Who received the highest salary in H1? 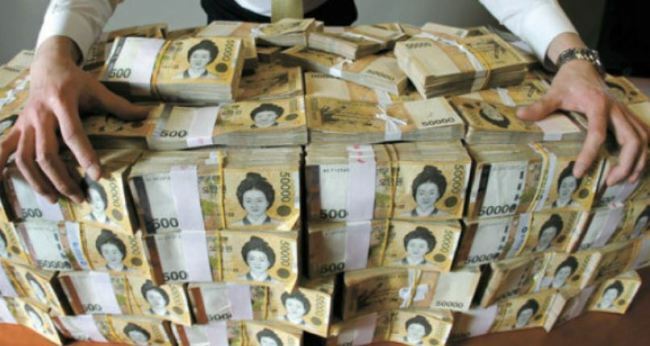 The salaries of chaebol owners and corporate executives in the first half of the year were unveiled Tuesday as the groups turned in their half-year salary reports to the Financial Supervisory Service. According to the FSS’ disclosure system, Hanjin Group Chairman Cho Yang-ho topped the list with 5.82 billion won ($5.13 million). Cho was followed by former Kakao M CEO Park Sung-hoon, who received 5.74 billion won. Park left Kakao M in March and now heads the game company Netmarble. NCsoft CEO Kim Taek-jin ranked No. 3 with 5.6 billion won. Samsung Electronics CEO Kwon Oh-hyun, who had topped the list for three consecutive years, received 5.17 billion won and placed fourth. Hyundai Motor Group Chairman Chung Mong-koo was next, receiving 4.96 billion won, followed by GS Group Chairman Huh Chang-soo (4.04 billion won) and SK Group Chairman Chey Tae-won (4 billion won). For the first time, retail giant Shinsegae Group reported its controlling family’s half-year paychecks, which came in at 1.99 billion won for Shinsegae Chairwoman Lee Myung-hee and 1.99 billion won for her husband and honorary Chairman Chung Jae-eun. Her son, Shinsegae Group Vice Chairman Chung Yong-jin, and daughter, Shinsegae Department Store President Chung Yu-kyung, received 1.7 billion won and 1.5 billion won, respectively. Members of the Shinsegae controlling family are not registered board members of its listed holding companies or other major subsidiaries, therefore it is not mandatory for them to reveal their paychecks. Shinsegae Group is largely divided into two businesses -- Shinsegae Department Store and E-mart. Both have industry-related subsidiaries, such as Shinsegae International under the department store and Shinsegae Food and Starbucks Coffee under E-mart. The group plans to create holding companies under each business and merge them to establish a separate holding company. According to the current law on the capital market and financial investment, registered executives of listed companies who earn 500 million won or more a year must report their annual salaries to the financial authority. But the law was revised in 2016 to require the top five executives with the highest salaries to disclose their paychecks as well, regardless of whether they are registered executives. Meanwhile, Samsung Electronics Vice Chairman Lee Jae-yong reported zero first-half salary, considering that he was released from prison in February after appeals and has just resumed his previous duties, according to the group. Cho Hyun-min, a former senior president at Korean Air who stepped down after the “water rage” incident broke out, received 1.74 billion won, including some 1.3 billion won in severance pay when she left the company. In the financial circle, Hyundai Motor Group’s financial arm Hyundai Card Vice Chairman Chung Tae-young received the most as an incumbent CEO with 2.25 billion won including some 1.03 billion won in incentives. Chung was followed by Korea Investment and Securities President Yoo Sang-ho, who received 2.02 billion won. Yoo has been serving the company as CEO since 2007, recording the longest stay in the securities industry. Citibank Korea CEO Park Jin-hei received 1.59 billion won. He earned the most in the first half among other presidents of banks here.